There's a storm brewing off in the distance and long before I can hear the thunder, lightening sets thick approaching clouds aglow. The day has been warm and muggy; air hanging heavy in late spring is a sure-fire sign of approaching storms. And how the day has unfolded, so goes my heart. Today was deep joy and bright sun and spring warmth, air thick and heated, and I knew tonight would be one of those stormy nights in my heart and head. We celebrated my niece's first birthday today with balloons and family and cupcakes with thick frosting, and it was good. My youngest played his heart out and snuggled me as he inhaled cupcakes and breaths of air. My oldest fawned over my niece. My niece smiled and snuggled against my chest, tired and deflated by the end of the party. In those moments of holding her close and heaving to pick up my youngest and watching my oldest wear his heart of love on his sleeve, I remembered the first baby we lost ... one I'd hoped would share a birthday or birth week with my niece. And in those memories, the second and third little lives we lost came to mind, too. I silently shushed tears during the party and instead soaked in what was right there before us, celebrated the lives of the children with which we've been blessed, gave thanks for the lives of the people we call family and friends. 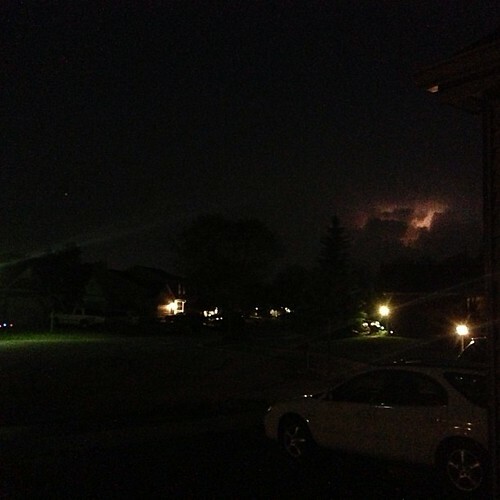 But tonight as I watched the storm clouds thicken and build and blow in, I couldn't help but blow out the deep exhales of frustration and tears I'd held back earlier in the sunned part of the day. 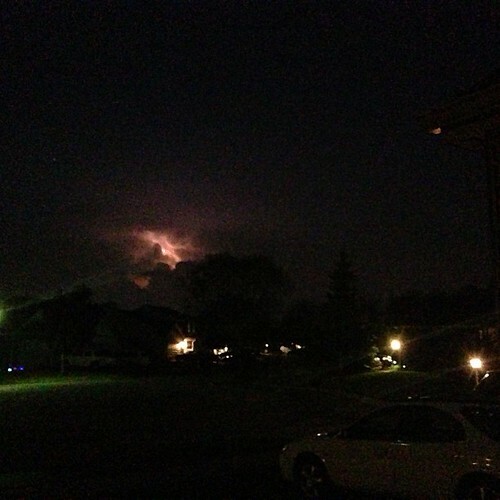 On a whim, I captured the pink of the clouds lit aglow by the lightening. And I thought about the news we'd received a few weeks ago from the genetic testing; it showed a probable cause for the miscarriages, a genetic one from my own DNA. An inversion on chromosome 13 likely explains why we lost those three precious babies; but we haven't pursued much more insight through the genetic counseling offered because honestly we're just not anywhere near the point of doing much more than healing. But I've looked long at these two boys we have with wonder since we got the test results. how they might be these tiny miracles clothed in skin walking around my house day in and out and we just never really realized or understood the magnitude of such miracles. On a note related to your bambinos. I saw a little one at the park today that looked exactly like tenacious E and it made me miss you somethin fierce. this is so beautifully written, as always. much love to you sweet girl. Beautiful, Hy. So miraculous, those lives -- your life! I know we've talked about this. Such miracles! The life we live is a miracle. You're a beautiful soul, Hy. Your boys are a beautiful reflection of you. Hugs my friend. Your wisdom and strength never cease to amaze me.